For the third year in a row, Bonnie and I ran the Memorial Day races in Marietta, a suburb on the northeast side of Atlanta. This always seems to be a tough race, with substantial hills in the middle miles of the race. This year, it also seemed to be a little warmer than in past years, plus I think that I'm about 5 pounds heavier at this moment. We had the pleasure of watching a Braves game in a luxury suite last night, but my pre-race fueling "strategy" ended up being two hot dogs, two servings of potato salad, a pizza slice, two huge cookies and one gigantic brownie. Having carbo-loaded to excess, I then tried the formula that had worked for me in my PR race in April: taking walk breaks only at water stations (about every 2 miles), and aiming for splits of 8 minute miles. I managed the first two miles in 7:50 and 8:10, but slowed down going up the first big hill at the beginning of mile 3, and never quite recovered again, running the miles 3, 4, and 5 in 9:22, 9:23, and 9:23. 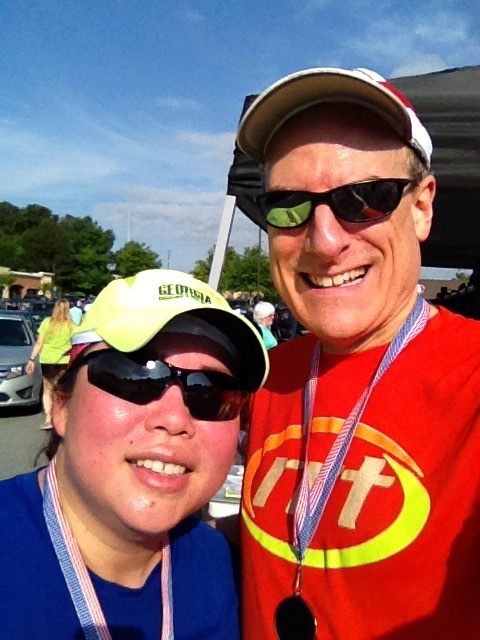 Nevertheless I had covered the first 5K in 26:22, and was satisfied with that mark, on pace for a 53 minute 10K run. I made it to the 5-mile mark in 44:08, just nine seconds slower than last year's time on this course. Unfortunately today I didn't quite have much "kick" at the end, managing only 8:53 in mile 6, crossing the finish line at 54:45. My feelings were a bit mixed at the end, having avoided the "shame" of a 55-minute finish, but "disappointed" that I didn't improve on last year's time. In all candor, those words have gone through my mind today, but really I should remind myself how happy I was to run faster than an hour in my first 10K in December 2013, and how thrilled I was when I first broke the 55 minute mark in October 2014. 1) It's not easy to haul 5 extra pounds up and down hills. I know how to improve that one, I just need the self-discipline to get back on track with what I'm eating. 2) Accept that I'm going to run a bit slower when it's warm outside. Today it was 68 deg F at the start and 79 deg F when I finished. 3) Realize that I'm not ready to run 8:00 minute miles for a 10K race. I went out too fast today, but I'm happy to have tried the experiment. One day I will manage it, but it will take more training. 4) Remember that three years ago, I was just beginning to run. Four years ago, walking three miles or 5K was exhausting. I doubt that I could covered twice that distance at any pace back then, at least not without a rest break in the middle.